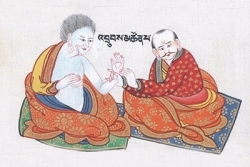 Traditional Tibetan Medicine is a holistic system addressing the body, subtle energy system, and mind by bringing disturbed energies back into balance. A full spectrum of modalities are traditionally employed including diet & lifestyle, dietary supplements, external applications, and spiritual practice. Energetic Analysis and offerings may be taken individually or as part of a package deal. We offer Personal Appointments, Individual Wellness Offerings & Wellness Packages. Online booking: Please use our booking form. Appointments are also possible in in Knappenberg, Kärnten, in Graz and in Salzburg. This analysis is the traditional method of classifying the unique ratio of heat (ti: tipa), cold (ti: beykhen), and energy flow (ti: loong) in the mind-body system. Through careful observation, Amchi-la will recommend the most effective antidotes for balancing these three vital forces on the basis of dietary supplements, external applications, and diet & lifestyle. Design your wellness program from the options below, or begin with a Nyepa Analysis and have designed for you. Full body + localized massage | 90 min · 84€ · Select any combination of the offers mentioned above. Bespoke to you… from the variety of the offerings provided, Amchi-la will create a package designed for restoring harmony to the unique state of your mind-body system. Please note: Additional weeks will receive a 5% discount. Herbal infused oil massage for deep relaxation; the cornerstone of restoring harmony to the mind-body system. Please let us know your preference regard the amount of oil to use. Small herbal sachets are integrated with an addition focus on balancing energy, relieving stress, invigorating the senses, increasing mental stability and concentration. Small herbal sachets are applied with gentle pressure on vital points to revitalize the channels and balance the flow of energy, beneficial for mobility and restoring sensitivity to the limbs. Warmed, round herbal enhanced poultices are used for an invigorating massage focused on reducing acute discomfort, regenerating tissue, invigorating the senses, relieving blockages in the mind-body system. Experience the unique luxury of two practitioners performing the massage of your choice. Synchronized movements and pressure are applied, harmonizing the conflicting natures of the mind-body system. A choice of either kunye or dukpa massage focused on the area of your choice, either head & shoulders, full back, or foot & leg. This may also be combined with a full body massage for extra attention on an area of discomfort. The mind-body system is united by a network of subtle channels stretching from the surface of the skin, deep into our internal organs. Dried mugwort is heated on specific points promoting circulation and relieving acute discomfort. This powerful method employs suction to detoxify, ease breathing, and relieve persistent discomfort related to firmly stagnated or imbalanced flow of energy. *) PLEASE NOTE that our center provides services strictly confined to the field of wellness. The Nyepa (life-force) Analysis deals with the condition and harmonization of the body’s vital energy field, and is not intended or implied to substitute professional medical advice, diagnosis, or treatment. All statements and recommendations are solely in reference to the mind-body energy system, and we are not responsible for treating or curing medical conditions. For professional medical attention, including diagnosis and treatment, always seek advice from a qualified healthcare provider or contact your primary care physician.